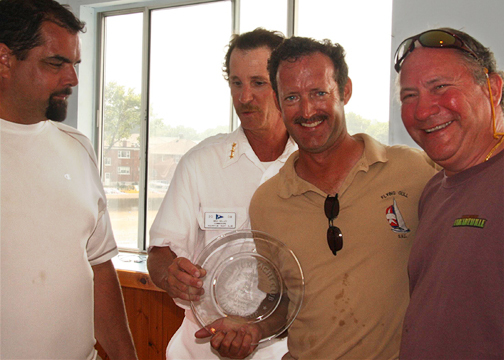 Ken MacLeod and crew Bob & Mark celebrate their victory in the 2008 Lipton Cup Regatta. Thur. June 19 Twilight Race SHYC Twilight Series 6:15 p.m.
Fri. June 20 Twilight Race SHYC Twilight Series 6:15 p.m. Sat. June 21 Solstice Race Hingham PHRF 4 p.m.
Thur. June 26 Twilight Race SHYC Twilight Series 6:15 p.m.
Thur. July 10 Twilight Race SHYC Twilight Series 6:15 p.m.
Fri. July 11 Twilight Race SHYC Twilight Series 6:15 p.m. Sat. July 12 Scorpion Bowl Hingham PHRF 5 p.m.
Sun. July 13 Hosea White Race SHYC 11 a.m.
Thur. July 17 Twilight Race SHYC Twilight Series 6:15 p.m. Sat. July 19 Lipton Cup Squantum MB & F5 10:30 .m. Sun. July 20 Lipton Cup Squantum MB & F5 10:30 a.m.
Thur. July 24 Twilight Race SHYC Twilight Series 6:15 p.m. Sat. July 26 QBRW Hingham 1 p.m.
50th Anniversary Race QBay to SHYC 3:30 p.m.
Sun. July 27 QBRW Squantum 1 p.m.
Thur. July 31 Twilight Race SHYC Twilight Series 6:15 p.m. Sat. Aug. 2 M-A-W/Spirit Series Cottage Park MB & F5 11 a.m.
Sun. Aug. 3 M-A-W/Spirit Series Cottage Park MB & F5 11 a.m.
Thur. Aug.7 Twilight Race SHYC Twilight Series 6:15 p.m.
Fri. Aug. 8 Twilight Race SHYC Twilight Series 6:15 p.m.
Sun. Aug. 10 Boston Light Race SHYC 11 a.m.
Thur. Aug. 14 Twilight Race SHYC Twilight Series 6:15 p.m.
Thur. Aug. 21 Twilight Race SHYC Twilight Series 6:15 p.m. Sat.. Aug. 23 PHRF NE Marblehead 10 a.m.
Sun. Aug. 24 PHRF NE Marblehead 10 a.m.
Thur. Aug. 28 Twilight Race SHYC Twilight Series 6:15 p.m. Sat. Sept. 13 Atlantic Districts SHYC F5 11 a.m.
Sun. Sept. 14 Atlantic Districts SHYC MB 11 a.m. Sat. Sept. 20 Chowder Cup Hospital Shoal PHRF 11 a.m. Sat. Sept. 27 Boston Harbor Is. Race George’s I. 10 a.m.
Draco was victorious at the Fred Hanson Memorial Race hosted by South Boston YC. Amr'a was second and Thunderation third. Draco and Amr'a swapped places at the Butch MacCormack Memorial hosted by Boston Harbor YC. Atomic Salsa was third. Mysterious Ways placed second at the Great Chase Race in the One-Design Class. Chikanery captured the Atlantic Districts by winning four of five races. Flying Gull had to drop out during the fourth race with a mechanical failure allowing Mysterious Ways to slip into second place overall. Mysterious Ways was the first Thunderbird to navigate the heavy fog at the 12-mile Boston Harbor Islands Race. Draco was second among T-Birds. Overall, Flying Gull won both the Fleet 5 Championship & the Mass Bay Sailing Assn. Championship. Mysterious Ways was second in both series while Atomic Salsa was third in the Fleet 5 competition and Thunderation third in the MBSA series. Mysterious Ways was also second in MBSA's PHRF Class E and second in the Hingham Bay PHRF Governor's Cup Series. Bob Larsen's BlewBird finished in the middle of the pack in the St. Michaels Dinghy Club Wednesday Night PHRF Series on Chesapeake Bay. BlewBird won the local Jib and Main series held on Fridays & Saturdays. Chikanery clinched the Twilight Series with a victory in the final race. Four races have been cancelled because of poor conditions. However, several of the recent races have featured photo finishes. Flying Gull took top honors at the Lipton Cup in July. A week earlier Flying Gull earned an impressive, second place at Hull YC's Scorpion Bowl PHRF Race in a nine-boat class. Mysterious Ways won Quincy Bay Race Week and the 50th Anniversary Race in late July. Thunderation prevailed in the Thunderbird Spirit Series at the Make-A-Wish Regatta in early August. Mysterious Ways and Draco placed 2nd and 4th, respectively, in a 10-boat class at the Bowditch PHRF Race in Salem. Thunderation easily won Savin Hill YC's Boston Light PHRF Race in August. Mysterious Ways and Flying Gull finished one-two at the Hingham PHRF Hitchcock Race. Chikanery (4th) and Mysterious Ways (5th) competed at the New England PHRF Championships in Marblehead. Chikanery is off to a fast start in the Twilight Series with three bullets in the first three races. Mysterious Ways took two seconds and a third, Thunderation a third and a fourth and Atomic Salsa a second, third & fourth. In the season's first race, Atomic Salsa was closing the gap on the three boats ahead when she became the first Broken Prop contender of the year by finding the mud off of Marina Bay. Some Fleet 5 T-Birds ventured into unchartered waters on June 21 at the Hingham Bay PHRF Solstice Race. The Birds were placed in Class C with a J-30 and a CS 30. Atomic Salsa became the second Broken Prop nominee of the season after getting caught in No-Man's Land between a sea breeze & land breeze. Geoff Youngman & crew could only look on helplessly as Chikanery and Mysterious Ways started the race just 40 yards away. After the tardy start, Salsa did not complete the race. In the meantime, Chikanery became the third nominee for the Prop when, in hot pursuit of Mysterious Ways, #154 came to a dead stop. The crew quickly determined the cause of the interference - a lobster pot in the middle of the race course - shed the pesky pot and got back in the race. With persistence, Chikanery cut into the big lead of Mysterious Ways and finished the race less than a minute behind - third overall. The J-30 took line honors and also won on corrected time with Mysterious Ways second. The CS-30 placed fourth.